According to reports received by the Gulf Centre for Human Rights (GCHR), the Omani Internal Security Service (ISS) has arrested prominent journalist Ibrahim Al-Maamari, Editor-in-Chief of “Azamn” newspaper. He is reportedly being held at the Special Division of the Omani Police General Command in Muscat, which is the executive arm of the ISS. On 28 July 2016, security forces arrested Al-Maamari. On 30 July 2016, an official source from the Public Prosecutor gave statements to the local press in which he said the reason for the arrest of Al-Maamari was the news article “Azamn” published on 26 July 2016 entitled "Supreme bodies tie the hands of justice," which referred to the corruption of senior officials and their interference in judicial decisions. The official source claimed that the news article discredited the integrity of the judiciary and other government agencies. He added that "what the newspaper has done is a public crime" and confirmed the Public Prosecutor's complaint against the newspaper and the start of investigation procedures based on Article IV of the Criminal Procedures Act. He also confirmed that an arrest warrant had been issued for Al-Maamari and that he is detained pending interrogation. The same official source stated that Al-Maamari faces several charges including violation of Articles 25 and 29 of the Press and Publications Law, which could lead to up to two years’ imprisonment in addition to a fine. He also faces charges of undermining the prestige of the state and its position in accordance with Article 35, paragraph i of the Penal Code as well as a misdemeanor charge for publishing news that would disturb public order in accordance with Article 19 of the Cyber Crimes Act. In another negative development, the Minister of Information ordered “Azamn” not to publish any news related to the case of its Editor-in-Chief, which forced the newspaper to release its issue on 01 August 2016 with some blank space on its front page. 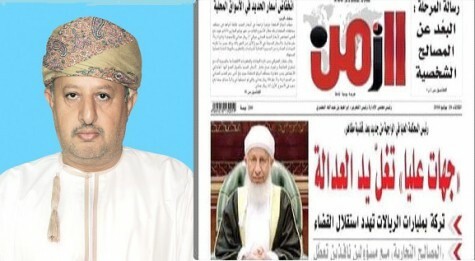 Al-Maamari is a prominent journalist who is well-known in Oman for his professionalism and integrity. The “Azamn” newspaper, which he edits, is a thorough and independent daily newspaper. He puts all his efforts into making it a new style of newspaper for classifications, themes, and ideas, where his primary goal is delivering the truth to the reader. He has already been targeted before, such as in September 2011 when he was sentenced together with the newspaper’s secretary to five months in prison for insulting the Minister and Deputy Minister of Justice. The newspaper “Azamn” was also ordered closed for a month, following publication of an article about the grievance of an employee at the Ministry of Justice, who was also sentenced to five months in prison. GCHR expresses serious concern about the continued acts of threats, intimidation and surveillance directed at human rights defenders, journalists and Internet activists in Oman. GCHR deplores strongly the human rights violations carried out by the Omani government and its security forces, including the arrest of Ibrahim Al-Maamari, which poses a serious blow to press freedom in the country. 3. Guarantee in all circumstances that all human rights defenders in Oman are able to carry out their legitimate human rights activities without fear of reprisals and free of all restrictions including judicial harassment. The GCHR respectfully reminds you that the United Nations Declaration on the Right and Responsibility of Individuals, Groups and Organs of Society to Promote and Protect Universally Recognized Human Rights and Fundamental Freedoms, adopted by consensus by the UN General Assembly on 9 December 1998, recognises the legitimacy of the activities of human rights defenders, their right to freedom of association and to carry out their activities without fear of reprisals. We would particularly draw your attention to Article 6 (c) “Everyone has the right, individually and in association with others: (c) To study, discuss, form and hold opinions on the observance, both in law and in practice, of all human rights and fundamental freedoms and, through these and other appropriate means, to draw public attention to those matters” and to Article 12.2, which provides that “the State shall take all necessary measures to ensure the protection by the competent authorities of everyone, individually and in association with others, against any violence, threats, retaliation, de facto or de jure adverse discrimination, pressure or any other arbitrary action as a consequence of his or her legitimate exercise of the rights referred to in the present Declaration”.